Independence Hall: Deal or No Deal? The US National Park Service protects and promotes nearly 400 sites. At most locations visitors pay an admission fee. However, entrance to Independence Historic Park in Philadelphia, Pennsylvania remains free. That’s a good deal because the Park includes numerous attractions like Carpenter’s Hall, Franklin Court, Federal Reserve Bank, the Liberty Bell and the famed Independence Hall. Who can complain? But, then again, shouldn’t tourists pay at least a nominal fee? Recently I visited with my two grandchildren, ages 6 and 8, and their parents. We started at the Visitors Center where we obtained complimentary timed tickets for a tour inside the legendary center. These vouchers are available on a daily basis and prevent time wasted queuing in line. Prior to our scheduled entry, we cleared security and entered a holding room. Now trust me, I’m a big fan of the National Park System and have never been disappointed with the value of a visit anywhere. However, on this particular occasion, the Park Ranger acting as our guide was either having a very bad day or felt the need to control others. Her opening 10-minute history lesson fell flat (as did her jokes) and many of the tourists became restless and fidgety. She would periodically stop her oratory and scold the “rude” guests, threatening to expel them. I personally felt uneasy and not particularly proud of this introduction, especially to foreign travelers. The presence of a screen at the front of the room begged for a slide show, power point presentation or a short video. I’m sure one of these would have captivated the audience’s attention far better. Once we entered the former Pennsylvania State House, we received another disjointed speech concerning the historical events that took place in the area. Unfortunately a group of East Indian tourists continued to talk amongst themselves- likely trying to interpret the saga. Our Ranger walked back to them and actually forced the group to leave the building. She returned and we scurried across the hall. We arrived at the signers room, the meeting spot where the Declaration of Independence was adopted and eventually signed. Sadly, our guide’s presentation just wasn’t captivating or compelling . The grandkids weren’t able to grasp the explanation and most of the visitors seemed disconcerted. Sorry NPS– No deal. My overall impression was disappointment; surely passion can be portrayed at to the birthplace of the United States. I regrettably discourage an inside visit for children younger than 8 or 10 years. Eventually the tour moved to the second floor and only then did I feel I was actually exploring the structure. The ascent and descent of the magnificent, wide staircase gave me the sense of traveling back in time. My footsteps were pounding the floorboards traversed by our Founding Fathers. This interaction was what I came for, to feel the history within the walls, not just stare at a roped-off room full of chairs. Happily, our adventure through the Liberty Bell exhibition hall proved far superior. 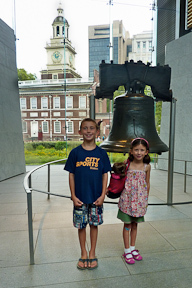 The kids loved seeing the crack in the bell and being close to the real thing, the symbol of freedom. Although the glass building is very modern, the Liberty Bell rests in a spot where visitors can look outside and see the steeple where it originally hung. We also meandered through a portrait gallery in the Second National Bank. To my delight, this exhibit offered an opportunity to come face to face with priceless works of art. No barriers here; numerous paintings of our nation’s forefathers, dignitaries and other illustrious 18th century characters cram the space. Afterward, we stopped for lunch at the Food Court (just what you’d expect) and walked a block to Franklin Court. Here we descended into an underground museum and watched the movie Ben and Me. The 1955 film remains as much a hit with today’s high-tech kids as it did years ago when my own youngsters first enjoyed it. I highly encourage viewing this 20-minute animated presentation. We also stopped into Franklin’s printing office. And… guess who demonstrated the press? 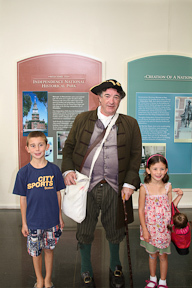 None other than our original Ranger guide from Independence Hall!! 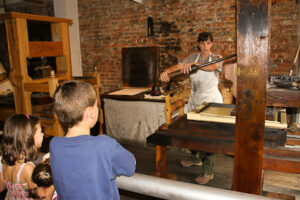 I was flabbergasted, but must admit she improved her act in the print shop. Here she gave a lively hands-on demonstration. Perhaps ink is her calling. Lastly, we returned to the Visitors Center so Kyra and RJ could get their Junior Ranger badges. The Park employees reviewed the question and answer booklets and the children took a oath. Upon completion, they were also handed a set of Historical Park trading cards. As far as the kids were concerned, these tokens were the best deal of the day. Anyone want to trade a John Hancock for a Tom Jefferson?? According to the UNESCO World Heritage Statement of Significance: Independence Hall was declared a World Heritage Site in 1979 as the location where The Declaration of Independence was adopted and the U.S. Constitution framed in the 18th-century. It is listed for association with the universal principles of freedom and democracy set forth in these documents, which have had a profound impact on lawmakers and political thinkers around the world. They became the models for similar charters of other nations, and may be considered to have heralded the modern era of government.